CHICAGO—Could the addition of a pharmacist to rheumatology care teams improve patient satisfaction, decrease staff burnout or reduce medication-related problems? Three panelists in Integrating Pharmacists into the Workforce, a session at the 2018 ACR/ARHP Annual Meeting, shared positive experiences with this interdisciplinary care model. Ten years ago, the Arthritis Treatment Center at Tufts Medical Center, Boston, added a clinical pharmacist to its interdisciplinary team two days a week, said William F. Harvey, MD, MSc, the center’s clinical director. In the first year, the clinic’s pharmacist focused on point-of-care benefit analyses and prior authorizations for outpatient biologics filled by Tufts’ 340b specialty pharmacy. “Our patients loved our pharmacist. 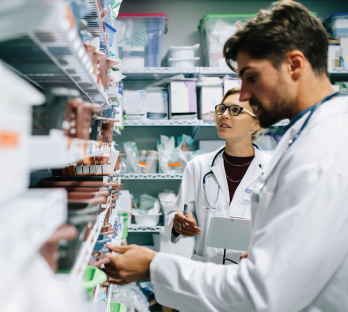 They treated the pharmacist like a member of the team,” said Dr. Harvey, noting patients frequently spoke to the pharmacist more often than to their providers. The clinic’s model for covering the cost of adding a pharmacist included increasing revenue for its specialty pharmacy, and in just the first year, the clinic found revenue rose slightly. Revenue grew substantially over the next 10 years to make the arrangement cost effective, he said. Five years into the arrangement, the clinic increased its pharmacist’s responsibilities to include obtaining all prior authorizations, conducting patient education and follow-ups regarding medications, talking with patients about manufacturers’ assistance programs, working rounds in the infusion center, performing medication reconciliations for complex patients and providing injection training. In a typical day in clinic, Dr. Harvey said he may meet with a new patient to review the treatment pathway, then call in the pharmacist to “go over anything the patient will need to know about the medication, and I focus my conversation on their prognosis, the natural history of the disease, what to expect,” he said. “Our pharmacist might teach patients how to do their injections, or if patients are afraid to do their own injections, she arranges for them to come back so we can do this in the office.” The pharmacist consults with patients about the cheapest therapies under their insurance plan and alerts providers when patients have drug side effects, he added.